J.R. Nyquist tells a truth that even knowledgeable Americans do not want to hear. We are not necessarily the world's only superpower and while we have been busy bragging, the Russians and chinese have been busy developing, producing and deploying new nuclear, chemical and biological weapons. We are endangered not only by missile attacks from rogue nations, but from China and Russia who are capable of threatening us with modern weapons we have intentionally neglected to build. Mr. Nyquist lays out his case in a series of notes, each on standing alone, but which cause us to think. He has made a real, but unpleasant case. We should take his warning seriously. 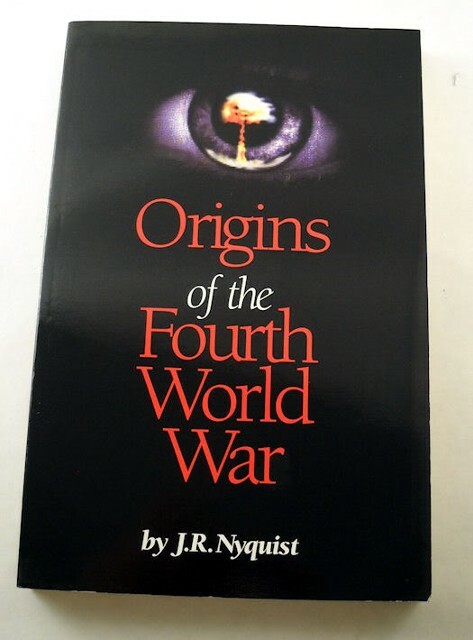 - Gen. Albion W. Knight, Jr.
My friend Jeff Nyquist's book, the Origins of the Fourth World War, is a brilliant result of long term and very professional geo-political research and analysis. His book is based on real facts and information connected with current international developments. Without any exaggerations, it is possible to compare the results of Jeff's work with an intelligence agency or a serious think tank's research and analysis during many months. His book is very important for the national security of America and needs to be used for the protection of the United Stats from current and prospective dangers. Alernately, you can send $25 to Mr. Nyquist's PayPal account jrnyquist@aol.com along with an email stating your order, name and mailing address. No American philosopher has sold more books to the general public than Rand—over thirty million at last count, with over a half million being sold on a yearly basis. Rand’s legacy is widespread and enduring. Yet, despite the extent of her influence, her ideas have not received much attention from scholars and critics. Her philosophical views, many of which are extremely controversial, literally cry out for interpretation and criticism. But little along these lines has appeared. Ayn Rand Contra Human Nature represents a major contribution to a critical understanding of Rand’s so-called “Objectivist” ideology. 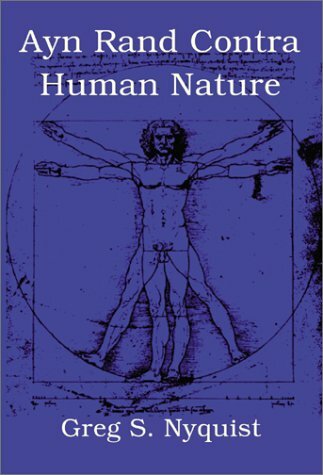 Based on extensive research of Rand’s writings, including her journals and letters, the book demonstrates how Objectivism sprung from Rand’s romantic and idealistic view of human nature. Rand repeatedly claimed that the goal of her writing was “the projection of an ideal man” and that her philosophy was merely “a necessary means to that end.” Using this insight as an interpretive touchstone, the book proceeds to explain how Rand’s views on history, human knowledge, morality, and aesthetics were profoundly influenced by her idolatry of the “ideal man” and where she went wrong in developing her unique but flawed vision of human society. In an age when political correctness has mangled truth beyond all recognition, nothing can be more to the purpose than an open and honest examination of some of the more salient issues confronting the civilized world. In Visions of Reality: Viewing Old Problems in a New Light, Greg Nyquist takes a fresh look at some of the central issues confronting civilized man in the twenty-first century. Essays on conservatism, democracy, moral externalities, the psychopathology of the left, economics, business cycles, and intuition all bring a fresh perspective on some of today's problems. The book concludes with two ambitious essays on the meaning of life. The essay “Realism and the Spiritual Life” attempts to give an unbiased, agenda-free account of the evidence for and against theism. The book concludes with an essay titled “Freedom and the Spontaneous Universe,” which rejects determinism in favor of a vision of the universe that is compatible with mankind’s experience of individual initiative and freedom.